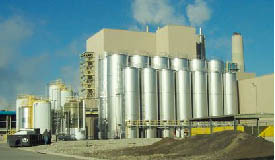 Silos - R-Cap Process Equipment, Inc. Suitable for all pumpable liquids. Capacities up to 70,000 gallons. Dimensions suitable for one piece construction factory assembly and over the road travel delivery. Product contact surfaces of stainless steel 304/304L or 316/316L. Designs with skirted flat bottom mounting or elevated legs depending upon size. Internal bottom designs for flat slope, dish, and cone shapes. Available with heat transfer surface on full side and bottom, suitable for heating or cooling. Or can be designed with internal coils. Insulation with outer stainless steel or painted shell. Access ladders, catwalks, rest stations can be provided. Suitable for free flowing powders and granular solid materials. Capacities up to 13,000 cubic feet. Dimensions suitable for one piece construction factory assembly and over the road travel delivery. Product contact surfaces of stainless steel, carbon steel, fiberglass, or cloth coating. Designed for product discharge by mechanical or pneumatic methods.